We were blessed with another perfect weather day. Plus we had a charter group of all women. How cool is that? The troup included Jacki K., Sandy, Dianne Kelleher, and Karen R. The outnumbered ones were Pete and The Captain. Veronica Atlantis provided the crewing and the Weight Watchers friendly snacks. I drove the boat and picked the anchorages even though The Captain pointed and shouted a lot. Hi, honey. Anyway, we powered up the Annisquam with Dianne Kelleher at the helm. She’s learning to be a crew member these days. Over the top of the island, we aimed at Straitsmouth Island. It is a calm and sheltered spot which usually has good visibility as a result. I put the hook into about 20 feet of water, just inside the cove. Fred dived with Dianne to video in a sandy spot. Everyone else was exploring. The water was 52 degrees at 35 feet and 57 degrees up in the shallows of the cove. The visibility was OK at about 15 feet. There were some big lobsters that were too big to take and/or had eggs. Dianne retrieved a 10 lb weight that I had handed to Fred to stabilize the camera. He had to leave it behind as he surfaced because he didn’t have enough hands to manage everything. Dianne came to the surface, determined he wasn’t going to return for it, dove back down to it, and then bumped it along the bottom to the down line. She then hand-over-handed it up the line to me. Great work, Dianne. We moved to the middle of Folly Cove for the second dive. As I rounded Halibut Point, aiming for the wall at Folly Cove, I wondered at all the boats that were moored there. By the time we left, there were over 20. We picked a relatively open area of the sandy bottom and I dropped the anchor in about 20 feet of water. The tide was still coming in and it was COLD on the bottom – 52. The visibility was OK, again about 15 feet. The Captain and I messed around a bit with the flounders, the video cameras, digging a trench in the sand, and other film-making activities. I saw a mess of squid eggs in the rocky outcropping right under the boat. Jacki and Sandy made a long dive to the east side of the cove. Several brave macho women went in the water in bathing suits. Pete and Fred scoffed, but they were secretly impressed with their hardiness, I think. The ride back to the marina brought us past a large mess of boats anchored at the south end of Wingaersheek Beach. Again, we could smell sun tan oil, hamburgers on the grill, and I heard Marvin Gaye with Se*ual Healing on someone’s boat’s loudspeakers. Summer is in the details, it seems. Super mellow day with great people. As you may already know, Veronica Atlantis is a long-time crew member on Easy Diver. It was blowing from the northwest (10 – 15 MPH with gusts to 25), so we decided to go south. There were long, low rollers from the south east. That made finding a site a little more challenging. First stop, the wreck of the USF New Hampshire. 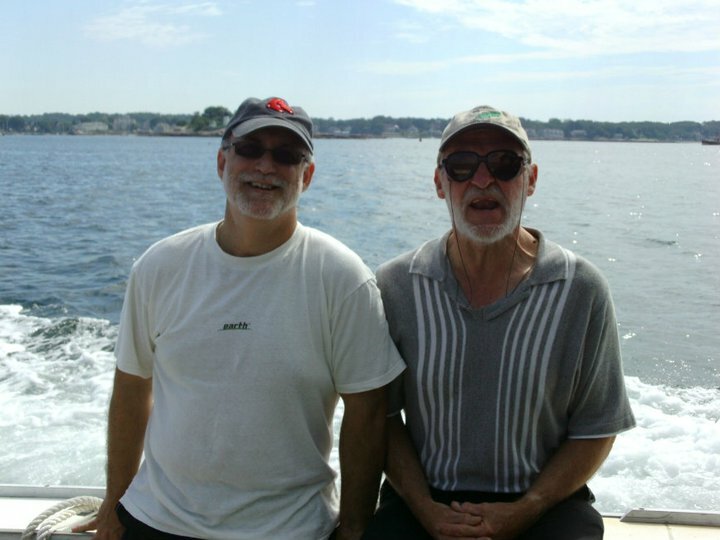 We were second to arrive after Cape Ann Divers’ big boat. I put us up into the shallow area to the west of Graves Island. Then the Donna III came in and anchored in deeper water. All three of us were looking for calm conditions where we could anchor and face into the wind. We had Alex and Candie, Will and Bob, Bethany and Hank, with Pete and Jacki as crew. I drove the boat and The Captain kept watch. The water was cold at 52 degrees at 30 feet, according to Pete and Will. The visibility was OK and they saw a too big lobster with eggs and a yellow sea raven. Will was working on his certification skills with Pete and they stayed close to the rocks to accomplish them. The high tide had turned by the time we were ready for another dive. This time, I picked Divers Leap near Saddle Rock. It was still very breezy here, but we were sheltered from the rollers and the bluffs diverted much of the wind. Some folk decided to sun bathe rather than make a second dive in water that Pete said was even colder. The sun shower helped me keep cool because I’d stand under it and wet my tee shirt and shorts and then go stand on the bow to look for bubbles. The wind evaporated all the moisture before we pulled anchor for the final time. The out-going tide was cranking through the Blynman Cut bridge, but I pegged the throttle and kept the nose up so we wouldn’t be flung about too much in the waves. We used ropes to negotiate our way back into the slip with the “reverse wind.” It worked great and there were no casualties. The relatively high tide made the gear schlep up the ramp almost easy. Good people on a day with non-optimal conditions. Photos are from July 24th. I felt better this morning and was glad not to be shorebound again. The weather was going to be cooler with breezes from the north. After driving around to find the best locations, we decided on the Back Shore. Bill Low, Alan Hicks, Joe Stark, and Dianne Kelleher joined Veronica, Pat and Pete who were crewing. I drove the boat at The Captain’s insistance. The tide was going to be low at about 12:30 PM. As a weather front went through, the breeze became stronger and we settled in at the Stone Garage. It has grooves and boulders in a rocky ravine which runs parallel to shore. Makes navigating easy. I was on the bow when I heard the shriek. It was Veronica remarking on the water temperature as she jumped in with her wetsuit. The water was even colder here than yesterday. Upper 40s on the surface. With a surge. And a low, uneven surface roll. Hum. But the visibility was good, according to Joe. I had anchored in about 25 feet of water and the explorers took off in all directions. There were some pictures taken by Alan Hicks. I’ll see if I can link to them in Facebook. None showed the extent of the cold water as well as Veronica’s exclamation. You’ll have to go to Alan Hicks in Facebook to see them. We decided to go to another site further away for the second dive. I had already picked the land features of the anchorage: about 1/4 mile off shore of the flagpole in the front yard of the Atlantis Motor Inn. It is a rocky and bouldery site with good hunting. I anchored in about 15 feet and the surge was less and the water was 4 degrees warmer, according to Bill Low. Visibility was OK.
We didn’t roll as much at anchor here so the topside wait wasn’t as irksome as it had been at the last site. Everyone had success as they measured it. Good day with good people. The weather was going to be even hotter today. I felt awful with a raging sore throat, so I got the day off. Pat and Pete were crew with The Captain making all the executive decisions. 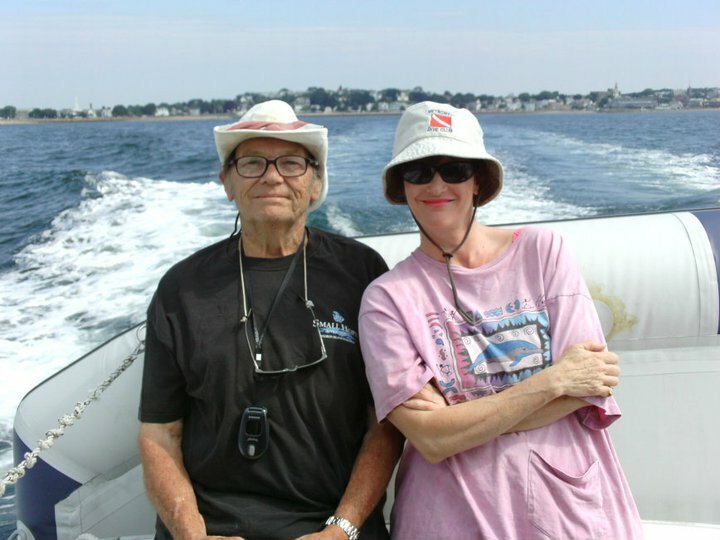 They had Jacki and Sandy, Bill Low, Richard Brandolini and a Dr. from the Gastroenterology group at MGH, and Mark H. Jacki asked for either Cathedral Rocks or the Rockport Breakwater. The conditions were best at Cathedral Rocks so that’s where they anchored first. I understand that the water was warmest and clearest in the first 20 feet. As you went deeper, the visibility degenerated into golden fuzz and the water got lots colder. In the upper 40s. Sheesh. Sandy, Jacki and Bill went all the way to the mud at 70 feet, so they must have seen the coldest conditions of anyone. Richard and the doctor were going slow and shallower because he was making his first cold water ocean dive in all rented equipment. As the morning cleared and it got hotter, the decision to go shallower for Mark’s bailout was easy – Folly Cove. Mark did great and everyone else explored the cove in shallow water to maximize the warmth factor. We had such fun last Saturday. We were happy to see Joe Finkhouse again. He joined Bill Low and Dianne Kelleher for the trip to Folly Cove today. We had Veronica Atlantis, Peter and Pat as crew. The weather forecast was calling for mid-90s with little breeze until later in the day. They weren’t wrong. I anchored near AR ER (graffiti on the rock wall under a wooden gazebo) to be sure The Captain had a good flounder videoing area. Pat saw a horseshoe crab on the hoof, but Pete denied it was possible. Horseshoe crabs don’t have hooves. That’s a sample of how the day went, folks. There was not a whiff of breeze at this spot and we swung on the anchor through most of the compass points and back again. It got hotter and muggier. Since The Captain had gone in without gloves for this shoot, I was pretty sure he wouldn’t be down very long. The rest of the participants in the sequence got misplaced somehow as did the second camera. Never mind, there’s always another day. Bill was able to stay in for over an hour. Dianne made several solo sorties using the down line and the anchor line. For the second dive, we moved across the cove to the wall near the Lobster Pool restaurant. By now, the breeze from the west had started, so we cooled off a lot. It was deeper here with fuzzy visibility, even though the tide was coming in. It was in the low fifties on the bottom and the high fifties on the surface. I hosed down a lot with my fresh water solar shower. Plus, I kept my tee shirt on to prevent too much sun. It was almost too hot to eat V’s legal snacks. Pat, Fred and I munched her offer of an apple apiece and kept gulping sodas and cold water. As we packed up to return home, the breeze cranked up a notch. The ride into the mouth of the Annisquam River was not too bumpy and wet, just enough to cool us off. Boats of every size were anchored cheek by jowl on the sand off Wingaersheek. You could smell the charcoal fires, burgers cooking and suntan lotion from our boat. V said it smelled like summer. We were thrilled that the ramp was almost flat on our return. But the parking lot was baking. It was surely in the 90s there. Good day with fine people. It was going to be a full boat. We had Deb and Steve, Kevin and Linsley, Linda and Kerry, along with Pete and Pat as crew, with The Captain and me. I picked the SW side of Kettle Island for the first dive to accommodate all these explorer types from out of state. I anchored the boat with the stern towards the best diving spot and hoped the passing boat traffic wouldn’t rock us too much. This site features moderate depth and beautiful, bouldery cuts and swim unders in the shallow area nearest the rocky shore. However, the passing parade took its toll and I rowed a sea sick citizen to the little beach at the north west side of the island. Peter reported it was 50 degrees at 50 feet. He said he rescued a big cod from an abandoned lobster pot. It was in good condition and hadn’t been trapped for very long. The rest of the folk moved around the island to a calmer anchorage for the second dive. Pat Walsh swam ashore in the barest of equipment to escape some of the heat. We explored the area and found warm little tide pools to wade in while waiting for the ill one to recover. After the divers were back aboard, I rowed Pat and the patient back to Easy Diver. The ocean’s surface wasn’t yet 60 degrees. No sense getting too much of a cool thing. The return to the marina featured a full bore chug into an outgoing tide at the Blynman Bridge. That was exciting. We had a day of death-defying adventure coupled with a nauseated friend and blistering sun. We had a full boat, with Pete and Veronica as crew. The participants included Linda and Myanna, Bill Low, Robert Kirby, Richard Brandolini and John B. The Captain had a cold, and I drove the boat. 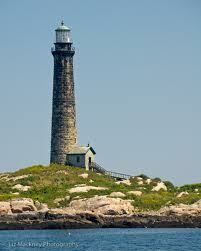 We decided that going to Thacher Island would suit everyone’s skills and desires the best. This is a beautiful dive site with lots of underwater boulders, schools of fish and even some crustaceans for those who care. The breeze was forecasted to be from the SW and that made the decision even easier. We arrived as the tide was going out. A little current kept tugging us on the anchor. I put it in 25 feet between the non-working lighthouse and the ramp that leads to the island’s boathouse. The water was warmish at 57 degrees in 25 feet. It was even better in the shallows. Gold light streamed through the sea weeds and growth covering the rocks. I wouldn’t say there were clouds of fish, but there were schools of cunner in many of the widest depressions between rocks. I was videoing and trying to keep the sun at my back. The troops felt it was good enough to make both dives here. I certainly wasn’t going to complain. 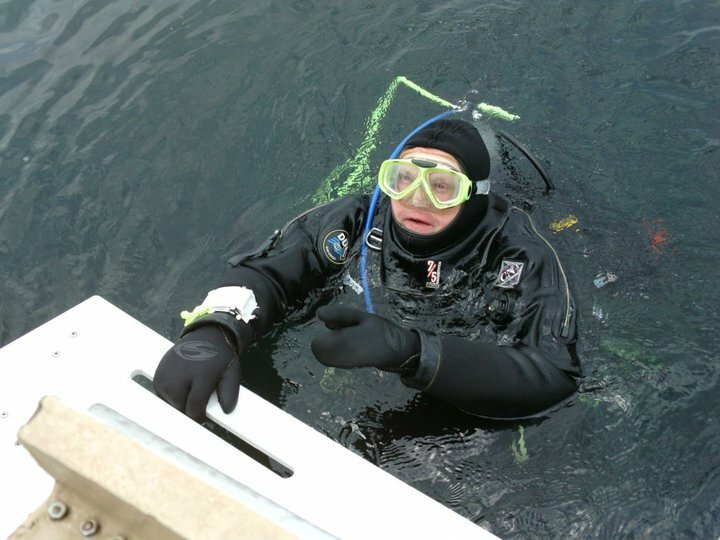 However, on the second dive, I dug out a dry pair of smaller gloves and a smaller hood so that the cold water didn’t fill any wrinkles or folds in the neoprene. That helped. It was a treat to snarf down V’s “legal” pita sandwiches with tomatoes, olives, basil, cheese, and spinach. Plus she brought extra apples for the hungriest among us. Guess who. We had fun with nice people.